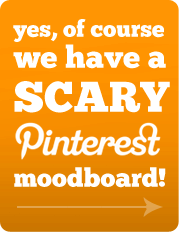 A lot of people experience fear when it comes to online marketing - especially social media, newsletters and blogs. It can seem like standing on the edge of a cliff, and not knowing if you can really jump off and not knowing what squishy mess you may land on or if you will even survive. We help people jump off that cliff and even enjoy the ride - gliding effortlessly along, with us holding your hand - with free guides, 1-2-1 training and a unique handholding design service to help clients get ready to proudly face the world in their superhero costumes. This way, important people - like potential clients, introducers and strategic partners - take notice and are impressed. As part of our unique service at Top Left Design we are expert handholders. We don't mean a clammy vicelike grip with claws that dig deep and draw blood! More a supportive warm dry hand to gently help you on your way. Read our post "Tricks you can stick up your sleeve to protect you from scary marketing monsters" for a really good headstart. And see below for our Treats as well! 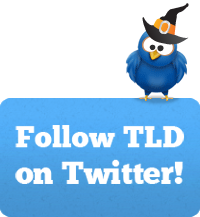 Email us with the subject "Twitter doesn't scare me". 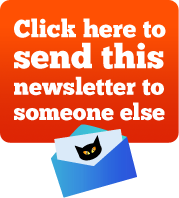 Email us with the subject "Blogging doesn't scare me". 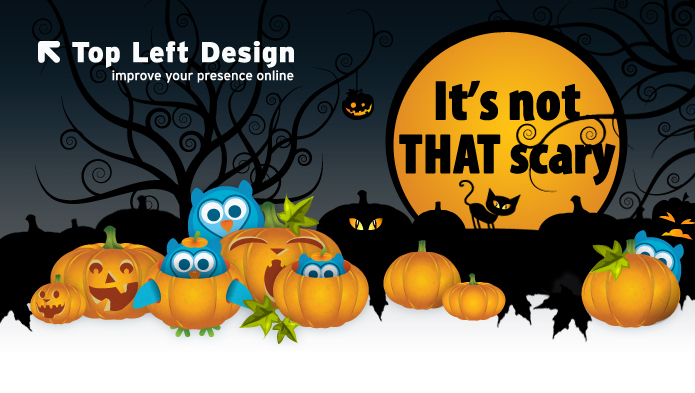 Email us with the subject "Facebook doesn't scare me" and we will create a cover banner for you. You know what is scary? We launched all of these sites! Bene Media is an independent marketing, public relations and events agency headquartered in Arlington, Virginia with an office in London too! Cate Meredith wanted us to create a cutting edge, glamorous and innovative brand as well as her new company website. Some of the great features included on the Bene Media website are the bold mixture of images - check out the PR page! The very glamorous blog which includes juicy topics! And the stylish fonts, background texture and icons used throughout. The Santon Group wanted a website which immediately showed off what they do and the types of projects they are involved in. The large slider on the homepage shows some great photos of some of their developments, these images are also linked to the map next to it - take a look at the flashing dots. Two other pages which show off The Santon Group developments are the projects page where each project has its own gallery of images and the Interactive map - when you hover the dots you can learn more about each development. Balance Books have been our bookkeepers of choice for many years here at Top Left Design. They felt it was high time for a refresh of their website and naturally, they came to us to do the job! We opted for a clean and simple layout that uses a subtle book shape to form the main container. Avoiding any cliched and dull imagery, we went for bright and visually engaging pictures and even included a fancy touch screen slider on the homepage! To top it off we included a nice new blog which you can head over to now for the latest from the Balance Books team. EPI is an independent, highly experienced and skilled seismic QC/QA consultancy to the Energy Industry. They wanted a new website that showcased what they offer at a glance, along with a few fancy effects in the form of a little jQuery wizardry on the home page! The services page clearly lays out exactly what they offer, with click-throughs into more detailed inner pages, and their team page showcases the impressive team behind the company. We also designed a downloadable brochure for them that matches the style of the website, and added links on both the about us page and blog. Landmark Heating are a heating company with a difference - they have an amazing website! Their 5 page website is straight to the point, quirky and informative. We created a pricing table which clearly organises their pricing structure in an organised and clear way, and have also used some great images on the homepage to illustrate what they do! Landmark Lofts create innovative, environmentally friendly loft conversions. We designed a clear website which allows visitors to easily learn more about different types of loft conversions (which we didn't know existed until we met Landmark Lofts! ), view a range of their projects and also have a flick through their updateable gallery. This website includes some great detailing which makes it entirely unique to the brand, from the rooftops on the navigation, to their illustrative loft images. Purcell are a leading provider of radio systems, hardware, management and system consultancy. They came to us looking for a complete rebrand, from logos and sub brands through to stationery and a sparkling new website! Taking inspiration from the sub brand colour scheme we brought this though into the website to demonstrate the different services that Purcell offer. Each of the Services pages are branded in their own colour that changes depending on which services is clicked on. We also designed a client stories page and a blog for them which they have been great at keeping up to date with good articles and lovely images. Atlas Translations is a translation company that offers great translation services for a wide variety of languages. We wanted to bring across a freshness to the website with a focus on mainly using typography instead of imagery to do so. This was done by creating a fading slider on the home page that is a collage of words - each slider pinpointing a different focus area of the company, such as a sample of their offered languages and the services they offer. Keeping with the minimal image theme, we used icons and coloured boxes to create impact on the services page and the languages and facts page, along with some quirky little flags in the box corners! Oyster Pier is a luxurious residential mooring in London which creates bespoke residential barges. When designing the branding and website for Oyster Pier it was important for us to reflect this luxurious feel throughout. We used a dark teal green and layered opaque circles with a mixture of serif and narrow sans serif fonts to create this feel. When designing the website we carried the combination of the bold teal colour and opaque shapes throughout. The homepage includes a large modern rendering image and 3 clear call to actions to key areas on the website including a walk through video! Mitravitae is a new company with a brilliant idea for making clean energy, food and water from renewable technology. The idea was to create a website that enhanced the idea of renewable energy whilst bringing across their message in a clear and concise way. This was partly done through the use of a slider on their home page and a clickable diagram on the integrated renewable Energy page. There is even a page with useful resources to download and a variety of ways for you to get involved if you want to contribute to the green industrial revolution! Be sure to read our extremely useful post and comment there - as you may have noticed, we give extra special love to people who love us.